Ideally I try to go to the grocery store in the evenings after Mr. Hubs comes home and all three of the kids are in bed. Realistically I'm tired at night and it's easier to lug Shrek and Donkey to the stores so that we can do our errands in the day. This being said....I have a problem. 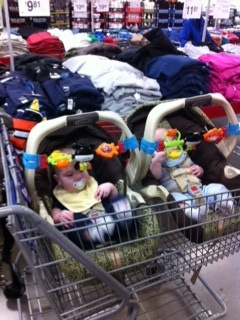 When I have major shopping to do I will "wear" one baby and put the other one in the cart. 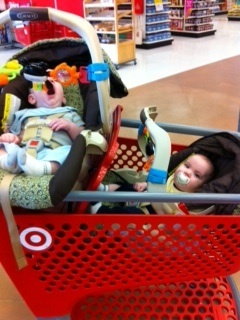 When I have a small list I will put both boys in the cart, somehow. 1.) because it is a pain to take a baby out of the car seat and wrangle them into the carrier. 2.) they are HEAVY! Carts are not exactly made for multiples. It makes shopping difficult. Where do I put my stuff!? I used to use my snap and go stroller when mine were that size, if it was a short trip, and if I could fit what I needed in the basket on the bottom. :). Good luck.